Our course takes you through all the basics of how to get started in the world of windsurfing. Traditionally it is a harder sport to learn than dinghy sailing, but with greater speeds and jumps it's hard not to enjoy this fantastic sport once you put in the time to master the basics. Nothing beats the feeling of moving across the water powered only by the wind. In association with Oxford Sailing Club. At Oxford Sail Training Trust, we focus on having fun whilst learning your chosen sport. We are an R.Y.A accredited sailing school, so you can be sure of quality training and good, safety-focussed supervision from all of our team. Whether you are looking for dedicated watersports tuition or just for a different environment to enjoy some outdoor activities, we have something for everyone. We run our courses in association with Oxford Sailing Club, who provide access to facilities and equipment. On completion of this course the successful sailor will be safety conscious and capable of sailing without an instructor on board in moderate conditions. 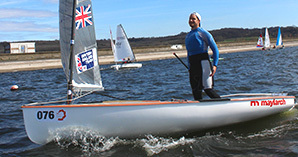 This course is designed to allow the sailor to practise and consolidate their technique whilst experiencing some of the thrill involved in advanced sailing, such as spinnakers, trapezing and simple race techniques. Please note this is a two day course. New for 2018, this course includes a discounted membership rate at Oxford Sailing Club so you can get out there and practise your skills. Why settle for just sailing OR windsurfing when you can do both? Our ever-popular multi-activity courses are designed to give you a basic grounding in both sports so you can choose which to continue with in future years. There's lots of fun to be had on this course and you'll make plenty of friends too! Sign up here for our newsletter. Keep your eyes open for monthly news & special offers.